Today, sadly, Katie departed back to Ohio and the universiy there. Her flights were somewhat messed up, but she made it. Somehow I hadn’t expected her to leave this soon. And I miss her. Well it’s over, it’s done, we’re resting. 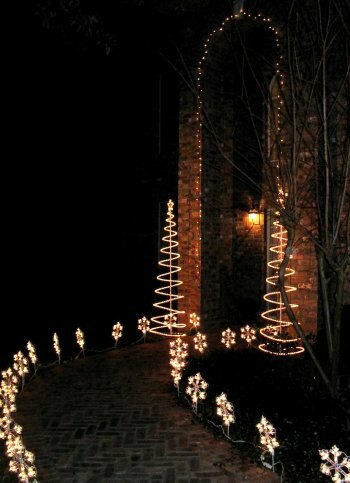 The Christmas holiday was fun and exciting. Beth went home to San Antonio to be with her family. Justin and Stephanie arrived on Saturday from San Francisco. Then it was go, go, go. Cookies to decorate. Lots of presents around the tree. Hours of opening. IMHO the hit present was a DDR pad and CD for Stephanie, who is the coordinated one of our small group. Bottom line, we talked and laughed and cooked and baked and ate and danced and slept. Yesterday Beth arrived back. Then dinner out for all of us was dressy and yet casual at our local Cool River restaurant. Early today Justin and Stephanie left. We’re sad they are gone. Now we’re on the other side. On the recuperative side. On the lazy relaxing side. Beth went to work. I’ve been watching DVDs. The rest of the family has been watching TV. I hope a good time was had by all, or at least from my prespective I think we did. shortly before opening presentsUpdate: See Justin’s Growing post for a more formal picture. Matthew, our middle son, arrived back home today. He is here for the holidays and beyond. That is because he has resigned from his current position with Texas A&M Library System. Now he is working towards his teaching certification in secondary history. This is an online program. In the process he has returned home to live with us to keep his costs down. Our quiet life will be a little less quiet, but that’s fine with us. Welcome home, son, welcome home. Over many years I have learned something about myself. I don’t like yard word. I especially don’t like fall yard work. This includes raking leaves. Oh sure it’s fun to make a big pile of leafs for kids to jump into, but the actual act of raking is a pain. 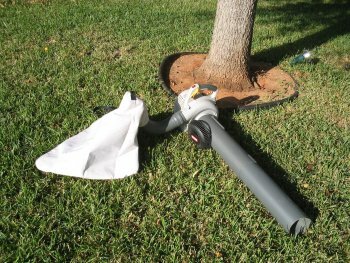 Many years ago I bought an electric leaf blower. It was like the clouds parted, the sun rose and my fall brightened, because this tool helped me do this mind numbing job. Then I only had to make big piles of leaves, put them on a tarp and drag them to the mulch pile. Naturally that tarp was a kid magnet, but I digress. Well yesterday I went out and got a brand-new handy-dandy gas-powered leaf mulcher. No more blowing for me. I’m now all into sucking those nasty little tree bio droppings into a bag with their other compariots. The first time with the mulcher was a learning experience and I’m still getting used to it. I still think I breathing in too much exhaust fumes. Nevertheless when the bag gets full I walk over to the large paper bio-refuse garbage bag, and I easily unzip the bag and unload the mulch into it. No piling, no tarp, and no dragging. Now the yard looks much nicer, and it was fun in the process. Sweet. I’ve been cooking all day. Six different cookies for the holiday. Some festive, but most just family favorites. 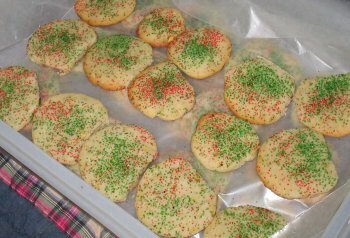 Mrs. Santa’s Butter Cookies. Especially enjoyed by my daughter (cooked or raw) from my mother’s recipe box. These need to be rolled out, cut into festive shapes with cookie cutters, baked and decorated with colored butter icing. But I’m waiting until this weekend to do this with the family. The problem is that the rolls of dough slowly get sampled by snitchers before getting that far. 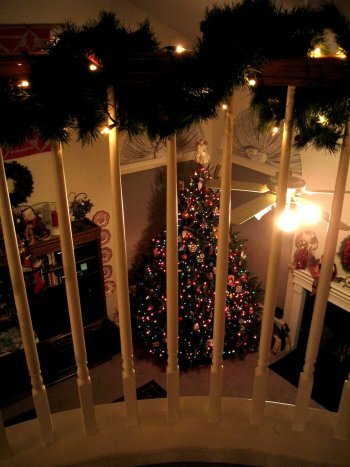 When we decorate we all sit around the kitchen table and talk while doing it – a fun time. 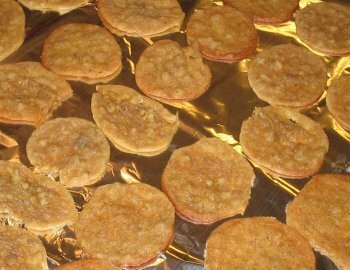 Ice Box Cookies (AKA Vanilla Refrigrator Cookies). A favorite of my wife’s from “The Joy of Cooking” cookbook. Scottish Shortbread. 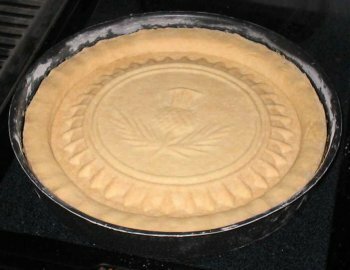 My grandmother’s recipe embellished with a highland thistle pattern. Simple to make and great to eat with a glass of cold milk (actually I should say “a cup of tea” based upon my heritage). Melt-in-your-mouth. A favorite of my oldest son from my wife’s family. Already fully documented at Justinsomnia. Note: I used walnuts in mine this time. Pecan Crescents. Another for my dear wife’s sweet tooth from her family recipe trove. 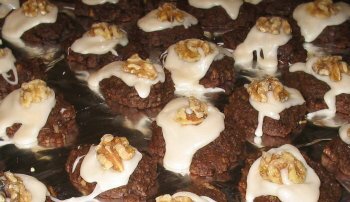 Chocolate-Walnut Cookies. A favorite of my middle son from my mother’s recipe box. 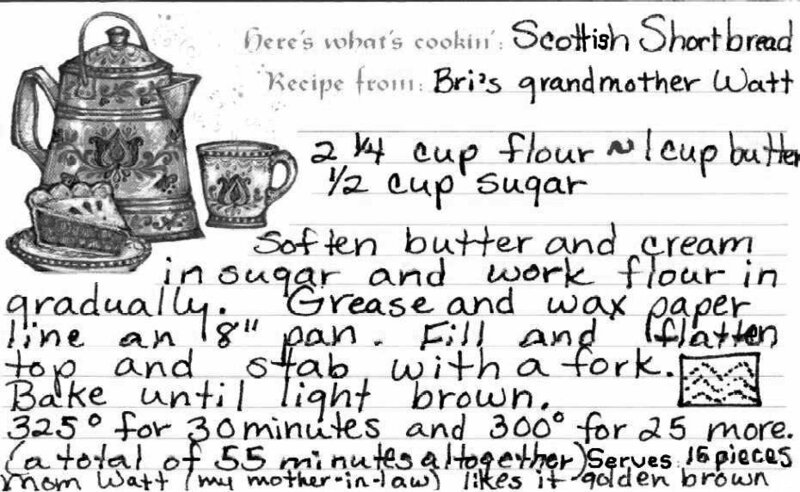 Update: Here is the shortbread recipe. 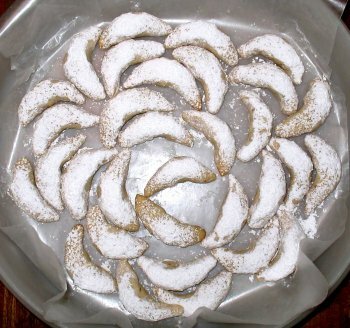 Only three ingredients: butter, sugar and flour. Select the image to make it larger and more legible. We’ve got family and company coming for the holidays. We need to feed them. Oh my gosh what shall we do. I know. Let’s make a pan of lasagna. Is that enough? Maybe not. Well then let’s make THREE ENORMOUS pans of lasagna. So that’s what Katie and I did today. 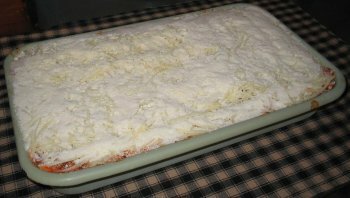 Many layers of meat sauce, noodles, ricotta, mozzarella and topped with parmesan. Our own little manufacturing line. Now they are all done. Think I got enough? Yeah. Now they are in the freezer waiting for the holidays and our guests. Here is what one looks like. This single uncooked pan weighs over twelve pounds. Update:Yesterday I took the two remaining pans of lasagna out of the freezer. Note: The first pan was devoured over the holidays. I dipped each pan into hot water to loosen it’s content from the pan. After cutting around the edges I removed the block of lasagna from the pan. With my workshop saber saw (recently cleaned) I sawed, yes sawed, each block into six smaller portions. 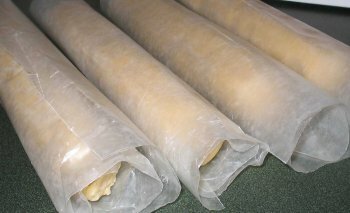 Then Kathy helped me to reseal them into vacuum-sealed bags. It was a bit messy, but doing it this way worked for me. P.S. I thought a circular saw would have been even messier although much faster. I’ve started doing a work project on my vacation. I know. I know. This is supposed to be vacation, but I’m having fun and it’s keeping me busy. I’m trying to figure out how to create an RPC (remote procedure call) interface on an existing C library of functions. This is so the caller thinks that what they are doing is local when in reality the function is being executed on a remote system. I’ll be on vacation until the end of the year. I nice break, but I’m not actually sure what to do with myself. Once the whole family is around it should be fine. I’m looking forward to seeing and hearing about everyone’s life while sitting around and eating some good home cooking. Kathy is now traveling to Colonial Williamsburg, but I have Katie and Beth to keep me company. We are helping each other get the chores done. Other than work and sleep and running, not much is happening. 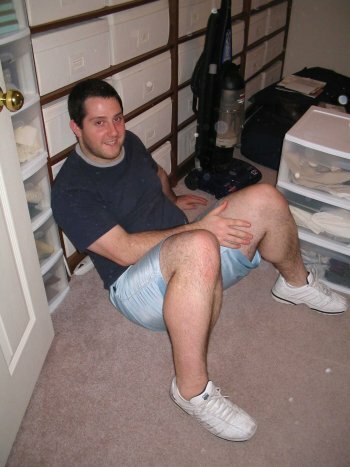 You are currently browsing the Watt's Up blog archives for December, 2006.